It's Wednesday again & my turn to give you some inspiration! With warmer weather on the way (at LONG last!) it won't be long before you will be getting invitations to those spring and summer weddings! 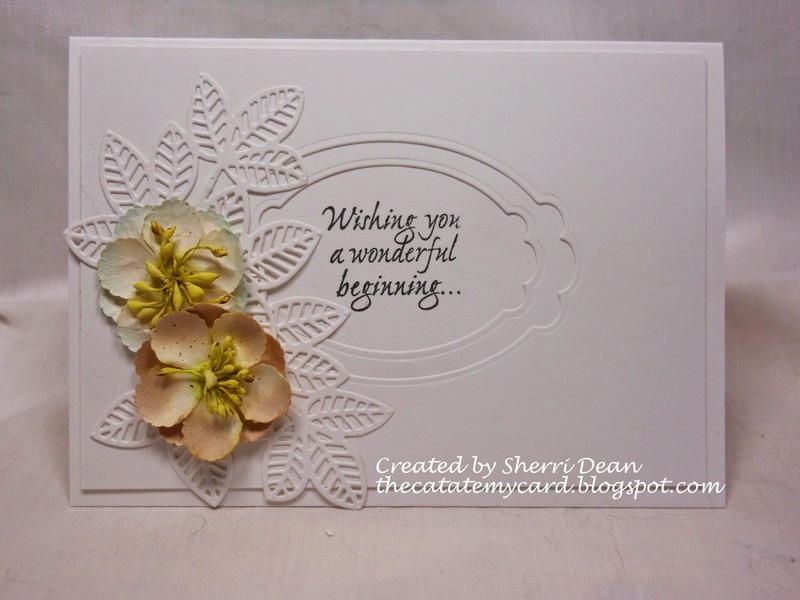 I have a really elegant card to share today & one that is SO simple to make! You only need two dies for it too! I used Spellbinders Labels Ten and Sue Wilson Faux Quilled Leaves. You might want to check out the Dies R Us store for all the other awesome dies you could use too! I wanted to create a "frame" around my sentiment by using the two smallest dies of the Labels Ten set. This is really simple to do, but let me give you a little tip when cutting a frame that will save you a lot of headache! Cut two pieces of your cardstock the size you need. Also cut a piece of waxed paper the same size and tape that to the top of one piece, lining up the edges for a perfect fit. Lay your smallest die in the center of the paper & run it through your die machine. Once you remove it from the machine, take that piece of waxed paper which now has the center cut out and place that on your second piece of paper, being sure to line it up again. This will show you exactly where the small die cut is on that piece you cut! Now, take your larger die and center that over the cut in the waxed paper & tape it down before running it through your machine. The result is BOTH of your beautiful cuts will be perfectly lined up once you glue them together! Trust me when I tell you that just trying to "eyeball" where the second die should go will never work! With the two pieces that you get from cutting the frame, I added my inside sentiment (from an old Stampin Up set) to the smallest piece, layered it to the larger piece and added another leaf. Hopefully, this has made you want to try this technique for yourself! Don't forget to check out the rest of the awesome inspiration that our great team has given you and be sure you also check out the Dies R Us Challenge blog for a chance to win a gift certificate! Enjoy the rest of your week!! Happy crafting! Just beautiful inside and out Sherri! Oh and forgot to add that I will be trying this technique real soon ... so pretty! Thanks!